THE COLONIAL tells the story of three-quarters of a century's concentrated effort to design a Waltham Watch with a special appeal to those who demand the finest timepiece. The Colonial represents the most notable development in horology, combining sound principles of Waltham watch construction with present-day demand for smaller and thinner watches. These watches shown on page 6,7,8 and 9 are the latest refinement of the watchmakers' art. The Colonial watch for professional, business and social life combines the highest art with the sound principles of Waltham watch construction. 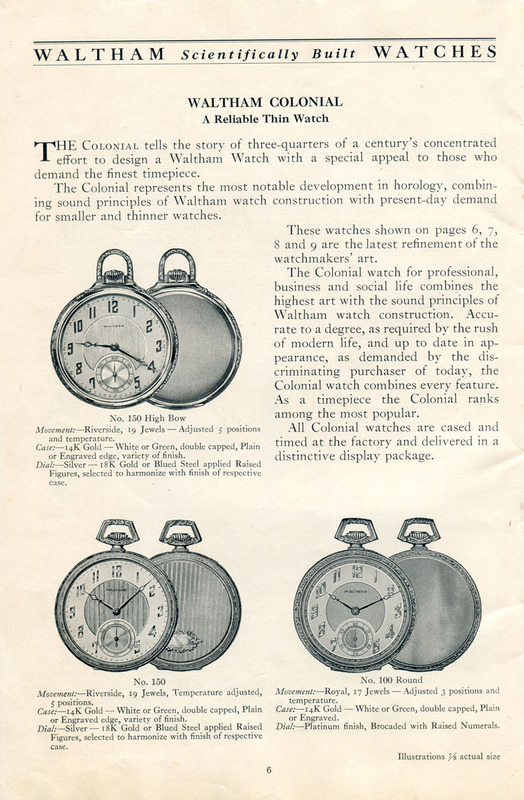 Accurate to a degree, as required by the rush of modern life, and up to date in appearance, as demanded by the discriminating purchaser of today, the Colonial watch combines every feature. As a timepiece the Colonial ranks among the most popular. All Colonial watches are cased and timed at the factory and delivered in a distinctive display package.